Alice Perlmutter is a stage manager specializing in corporate events, broadcast, awards shows, press events and more. She has been stage managing in the corporate world for almost 25 years calling shows for IBM, Toyota, Chrysler, Pfizer, Canon among others. She has been using excel and paper for her production cue sheets since she started... until now. 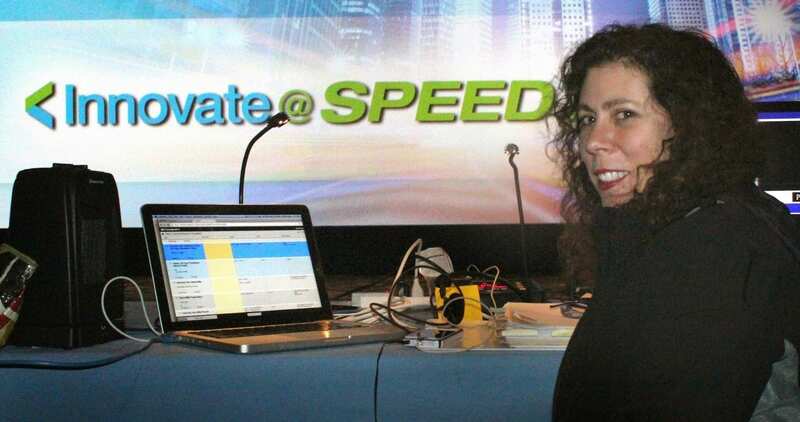 Recently, Alice had the opportunity to use Shoflo, a cloud platform for building production cue sheets, on the IBM Innovate 2014 event in Orlando FL. 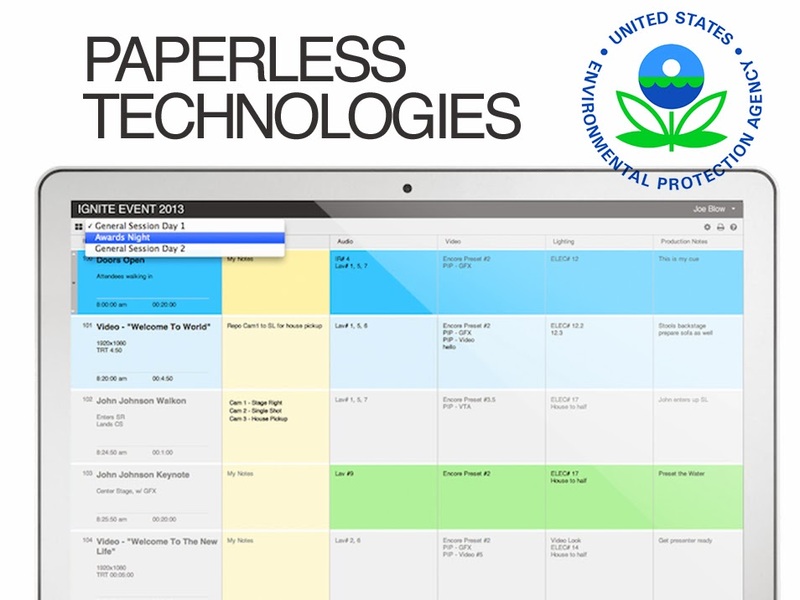 Drury Design, a New York City based production company that services global brands including IBM, has been a leader in sustainable event practices for years and has chosen Shoflo for its real time editing features and to help reduce the on site paper waste. "I had heard about Shoflo over the past years, but had yet to use it on site. I must admit, I was excited and unsure of what to expect." says Alice, Stage Manager. Stephen Bowles, Founder of Shoflo, says this hesitancy is not uncommon for Shoflo, as the industry has been very deep in current practices of creating cue sheets in excel and printing them over and over again. "Yes, it's a little different, but I came from the production industry my self so I know how frustrating the current excel and print cycle is. 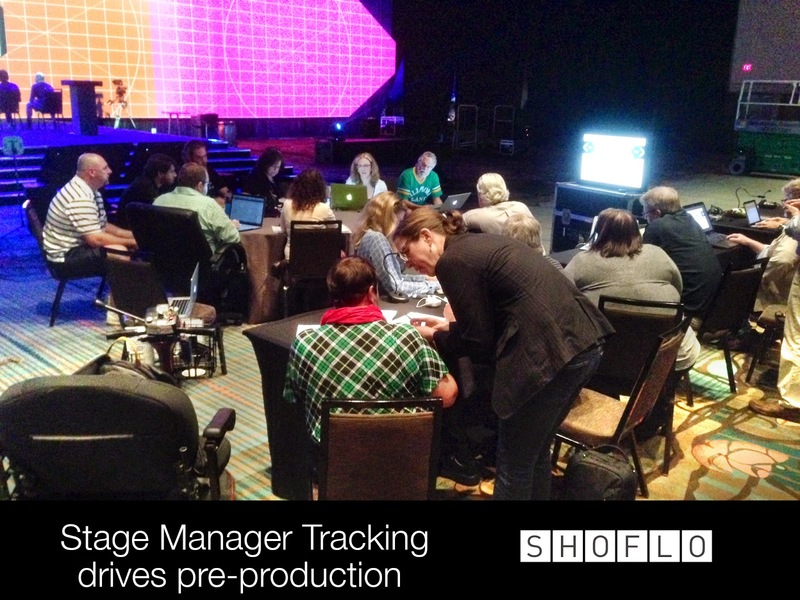 Every stage manager & producer is initially hesitant about Shoflo, but once they see and experience all the benefit adds that come from real time edits and stage manager tracking... the doubts disappear" says Stephen Bowles, Founder of Shoflo. Initial Online Demonstration with Drury Producers & Owners. Second Online Demonstration with Alice, the Stage Manager. Once on site: Show crew was invited to the event on Shoflo. Pre-Rehearsal staging meeting where crew tracked stage manager live. Rehearsals began with edits happening often. Alice makes edits and are instantly reflected in Shoflo for the whole crew. Reduced paper waste by 80% during rehearsals. Show: Alice called and advanced the Shoflo cue by cue with the crew tracking live. "I found myself more engaged with the cue sheet then usual because I knew it was up to date. The scripts and my remaining show book was more out of date than Shoflo... which in a funny way is kind of backwards! "- says Alice. 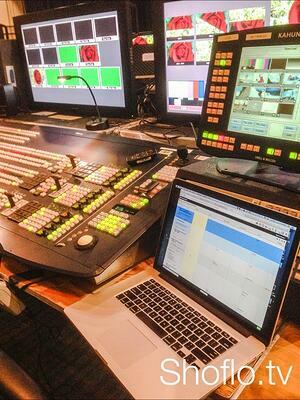 The entire crew tracked live as Stage Manager Alice advanced from cue to cue throughout the rehearsals. Live Cue Tracking actually removes the need for Stage Manager's to always be shouting out current cue #'s over production com. 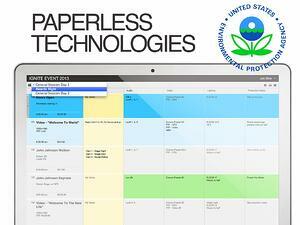 The IBM Innovate event reduced cue sheet paper waste by 80% over last year's event. That's 20 crew members with an average of 100 sheets of paper each equaling over 2000 pages of paper waste avoided by using Shoflo this year. The event went flawlessly with the client fully satisfied. 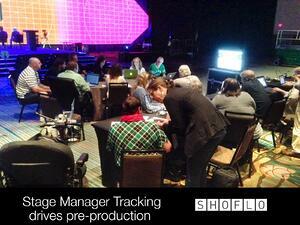 Shoflo performed excellently throughout the rehearsals and show, keeping the crew on track and reducing paper waste. Find out more about Alice Perlmutter here. Find out more about Drury Design here. Find out more about Shoflo here.